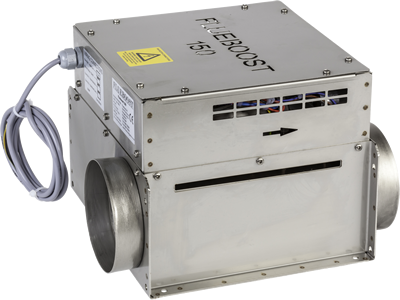 The flueboost Boiler model 150 handles flue gasses up to 200c and boilers with a heat output of up to 150,000 Btu/h; 44Kw/h, dependant on size and length of flue. Normal secondary flue temperatures of the average gas appliance working at 75% efficiency are 180c with CO2 at 5%. This unit can be converted for use with gas fires by installation of a factory fitted circuit board which has no pre purge. Please contact Flueboost if this option is required. The motor is again of fixed speed and features an external rotor with a secondary cooling impeller. This time Class F windings but again adequately lubricated ball bearings and is maintenance free. Making this reliable and operational for years. The contacts open if fan failure or a blocked flue has occurred. The contacts close with normal airflow. A full manual of instructions for operation and maintenance is delivered with this unit as with all our units. Again if service and repairs are required the working parts can be removed as sub assembly, which leaves the main casing intact. This unit is supplied with a type 4 core ‘yy’ cable. Again as with our units they are numbered 1-3 and are yellow/green in colour. Again 1 = live 2 = neutral 3 = becomes switched live at 220-240 vaults. Gas fire models of this unit have no pre purge. The fan on the boiler model has a built in pre purge of 30 seconds which purges the boiler of any gasses before ignition. This appliance MUST have a draught diverter or draught stabiliser fitted within the primary flue section. Unit fuse in control unit. Less than 70 dBA at 1 metre.